Inducted into the American Quarter Horse Hall of Fame in 1994. ​Sugar Bars’ greatness did not come from burning up tracks or winning dozens of show ribbons. His mark was left by the horses he sired. Foaled in 1951, Sugar Bars was by Three Bars (TB) and out of Frontera Sugar by Rey. At the time, Three Bars was not much to write home about, and Sugar Bars was one of the Thoroughbred’s finest offspring to hit the track. Breeder and owner George Wood of El Paso, Texas, leased the sorrel colt to Ken Fratis of California, for race training. Sugar Bars hit the track as a 2-year-old and placed in all six starts. An injury in 1953 and a poor showing in early 1954 caused Wood to sell the colt. The new owner, Roy Hittson of California, raced Sugar Bars through the summer and fall of ’54. The sorrel colt ran last as many times as he did first. During his last race, Sugar Bars ran a 350-yard race in :18.10, a AAA time, and as fast as the fabled Moon Deck with the same weight. Needing quick cash, Hittson offered the stallion to the first person with $2,500. That person was Bud Warren, who lived in Oklahoma and owned Leo. Warren had wanted a Three Bars son to cross on his Leo mares. The pairing or Sugar Bars and Leo bloodlines clicked, churning out stakes winners. A few of these were Connie Reb, Counterplay, Pacific Bars, Gofar Bar and Vanna Bar. The sorrel stallion also sired performance horses Otoe, Justice Bars and Figure 8 Bars. After owning the stallion for several years, Warren sold Sugar Bars to Dean Parker and Sid Huntley of Madera, California, in 1968. Sugar Bars stood to a full book of mares for three years before succumbing to heart failure following colic surgery. 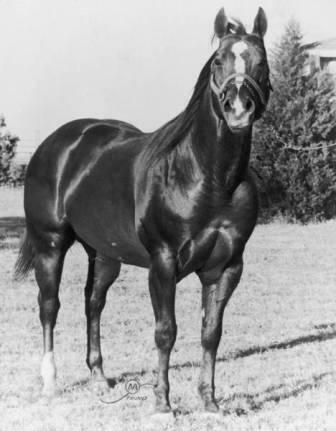 Sugar Bars died in 1972 at 21, and was inducted into the American Quarter Horse Hall of Fame in 1994. Please click on pedigree for photo.